BuzzXplore works like Windows Explorer so it is intuitive to use and familiar the first time you open the software. Provides all the essential tools for organizing and finding your design files - locate, print, sort, drag and drop, cut, copy, paste, rename, convert, zip and unzip files and so much more! Embroidery Drive Writing Wizard - quickly write to USB embroidery drives, Bernina drives, compact flash drives and even external hard drives. Enhanced Artista Support - display and convert from artista v4, 5 and 6. Advanced search tool - displays search results in a new results catalog. List Report - to print a complete folder tree and their contents even with a file filter activated. Enhanced Catalog Mode - Catalog mode now allows you to include multiple or non-contiguous folders or designs to create the exact catalog you need! Bonus! BuzzEdit Lite for basic design editing. Bonus! 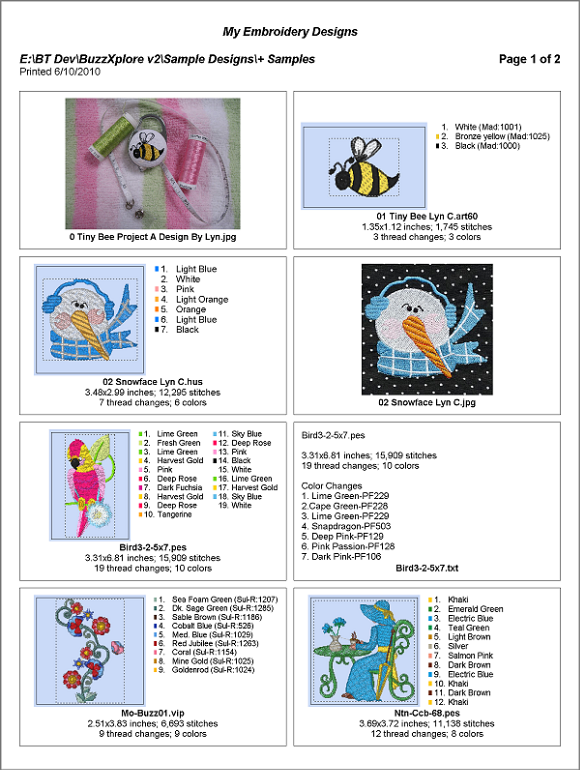 Thirty professional embroidery design samples. BuzzXplore is wonderful and has worked wonders in managing and converting hundreds of my designs. It has worked like hundred aspirins, all headaches gone. No separate Catalog to maintain. Works directly on the files on your computer. 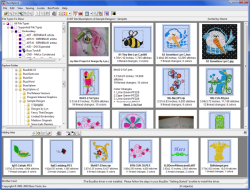 View and organize all of your embroidery designs and graphics in one place, even in Zip archive files. Catalog mode allows you to include multiple or non-contiguous folders or designs for conversions, sorting, reports or just browsing. Automatically create a folder tree of over 500 design categories for organizing your designs. Move or copy files between folders with a simple drag and drop. 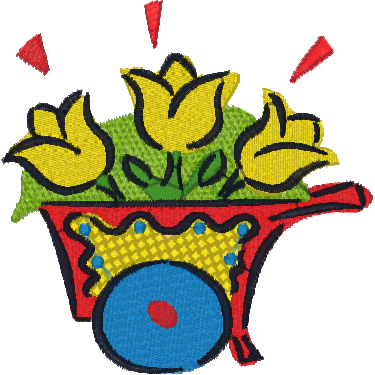 Launch MOST embroidery software even most you can't launch from Windows Explorer. Use the included free BuzzEdit Lite to change thread colors, or rotate, mirror or flip designs. The BuzzEdit Lite sew simulator lets you "see" how your designs will sew. View only the files you need by using powerful file filters. Automatically create design note files for storing additional design information. Watch a 3-D slide show of your designs to quickly preview them. Zip'd designs can be viewed, converted or printed in reports without unzipping first. Quickly extract the contents of Zip Archives using the Extraction Wizard or just drag and drop the into the desired folder. Embroidery Drive Writing Wizard makes it easy! Accurately convert designs on-the-fly or thousands at a time in seconds to the folder of your choice. Display graphics files along side of your embroideries. Great for keeping pictures of your projects. Accurately convert graphics from one graphics format to another. 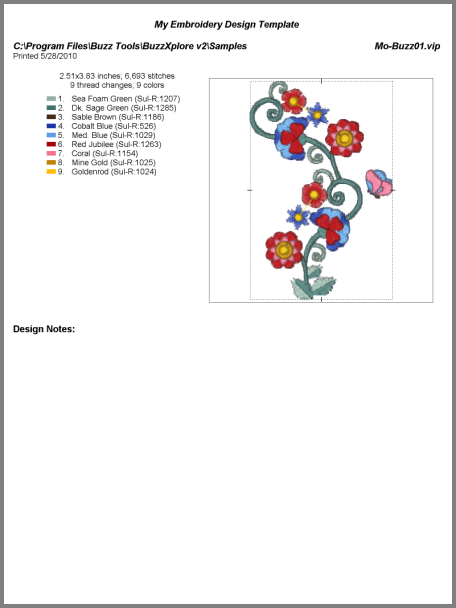 Create graphic "snap shots" of your embroidery designs in beautiful, realistic 3-D.
Print design lists, thumbnails or actual size. 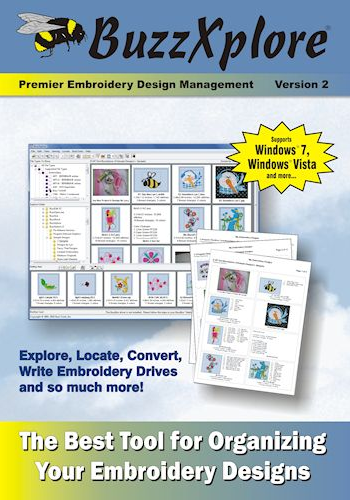 Create professional-looking design catalogs for embroidery customers to browse. Customize your thumbnail reports to include sewing information and number of thumbnails per page. Print actual Size with complete sewing information. Great for at your embroidery machine. 30 Free Professional Embroidery Designs. Several professional embroidery design companies have included some exclusive embroidery designs for you to sample. Visit the BuzzXplore Education and Support page for more information. Here are just a few sample BuzzXplore screens and reports. Click on any screen to view it full size. Click on the X to close the model window and return to this page. 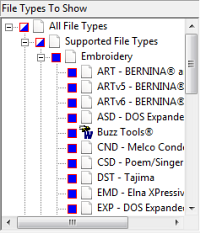 The BuzzXplore workspace includes a file filter, folder tree, contents area and a special holding area used for projects or embroidery card/drive writing. Preview your design in beautiful 3-D threads. The actual size pop-up window lets you see a larger view of your design in realistic 3-D which makes it especially easy to view fill patterns and outlines. Instant 3-D Rendering is the fastest in the industry and it allows users to instantly view multiple designs at a time and see how they will look when sewn. The designs are shown in the main display window. No need for a separate preview window. See only the file types you want! File Type Filter Powerful file filters make it simple for you to view only the files you desire. Just click on the file types to include! The Embroidery Card / Drive writing wizard provides easy card writing for numerous embroidery machines. Just pick the card/device from the drop down list and let BuzzXplore do the rest! Even writes SHV Formatted diskettes for the Designer 1. Print a Summary Report to create your own custom design catalog. 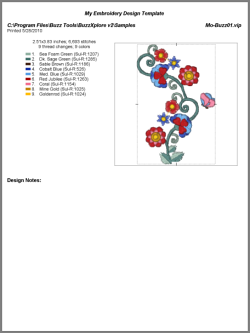 The example, includes note files and scans of stitched designs along side the embroidery designs. This report was customized to include 2 x 4 designs, detailed sewing information, hoops and borders. Print a design in Actual Size as an aid for design placement and hoop alignment. ! The following comments were submitted by users of BuzzXplore. We'd love to include yours! Submit your comments now! Oh my gosh, I love "BuzzXplore"!! I couldn't live without it. For about 10 years I worked with the Martha Pullen Company as a Quality Assurance representative for all of their embroidery designs and always used your software to assist me in checking and approving their final designs. I retired about two years ago but still have contact on a regular basis with the girl I was partners with at that company. I would be very sad to not have the latest version of BuzzXplore. My partner and I always used your software to generate multi-formats for special work we were involved in creating. Will be anxious to check out new software you are coming out with. Thank you for notifying me so I can continue reviewing the great software packages. I made sure that I responded to stay on the Newsletters. Again, thank you for all your wonderful software offered. Love, love, it. I have been a BuzzXplore devotee forever. So easy, and beats the more expensive ones hands down. I absolutely would not get as much use out of my embroidery machine if I didn't have Buzz Tools software. I keep my files organized with BuzzXplore. I have a folder set up for each category, for instance Horses. When I bring up horses, my collection is right there. Under my floral folder I have a subfolder for each variety of flower, rose, lily, violet, etc. BuzzEdit with BuzzSize installed allows me resize, change colors, change stitch density, remove parts of a design, print a template for placement, etc. I just couldn't do without it. By using the template I can place it exactly in the right place in the hoop. I am a quilter and use BuzzWord for all kinds of projects. It makes beautiful labels for my quilts. I usually design the wording on my label and add a border or corner design to make the label look really nice. All in all I would definitely recommend Buzz products. Have recently bought BuzzXplore and BuzzSize and can't believe how user friendly they both are. I just love them and won't use any other program in the future. I am a Janome and Artista digitizer and sell designs on my websites as well as teach software and embroidery. All of my students are always amazed at the "cool" program that shows me the photos I am looking for and the photos of all of the formats of my designs and so much more. Even though both the programs I have do a tiny style of this it is not even close to what BuzzXplore does. Each conversion is clean and works like a charm no matter WHAT the format. I keep my original format stored and then make a conversion ONE time to each customers format so they get a clean conversion every time. If I knew when I started embroidery that BuzzXplore was out there it would have been the ONLY program I would bought besides my digitizing programs. It is the ONLY program I use for my teaching and my business now. I won't open my computer if I can't open BuzzXplore. I started with Buzz Tools and got BuzzXplore shortly after it came out and have loved it ever since. BuzzXplore is so easy to use. 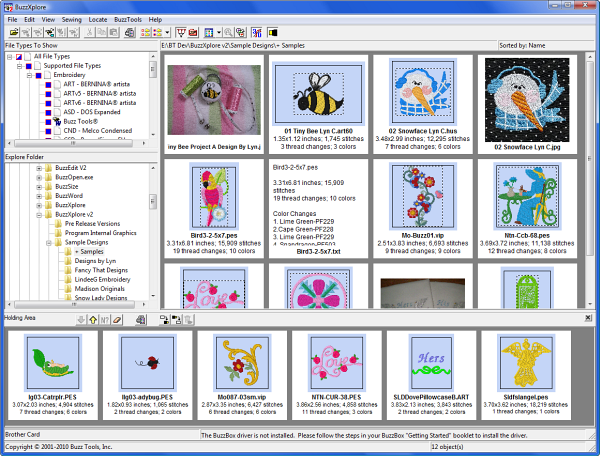 Works much like Windows Explore, but also lets me make folders, drag and drop, make zips, do conversions, look into zips, check my camera photos, read and create text files, catalogs my designs, and even prints out catalogs with full information for shows and such. You can't go wrong with BuzzXplore, the program and the support are unbeatable. There is no way to show me jumping up and down is there? LOL!!!! BuzzXplore is really awesome. You have ALL the functions of Buzz Tools Plus PLUS all the functions you can do in Windows Explorer and it is right there in BuzzXplore. You can make new folders on your hard drive, delete folders AND files, copy, cut (move designs) and paste, RENAME files and folder and don't forget the 3D viewing capabilities. Don't forget, you have the greatest support from the Buzz Tools people if you ever run into questions and/or problems with all of their software products. Give it a try!!! Whoever designed BuzzXplore is just too cool for words!! I ordered this program mainly for the conversion aspect. I needed to convert from .art format to .hus. (Even the Husqvarna program doesn't do that.) Meanwhile, I have had more fun playing with this program. It is sooo great seeing all of my designs together, regardless of format. This is an exceptionally easy program to use. Absolutely fantastic!! I just received Buzz Explore and I love it! Someone was really thinking like a home embroiderer when this was designed. It works like a dream. No guessing. When I need any help, the manual answers any questions easily and quickly. GREAT JOB!!! Thanks a million! BuzzXplore is wonderful and has worked wonders in managing and converting hundreds of my designs.It has worked like hundred aspirins, all headaches gone. Recently received my new BuzzXplore. Thanks to the programmers, you guys have done it again. What a wonderful program. I have been exploring all the new options and features. Wow! I really love all the new features. This program is great. I will be telling everyone about this software. The BuzzXplore program is very good! Your display is set up so you can use the scroll bar for each folder. Actually, it is a lot like Windows Explorer. You can have it show ALL the files (not just design files) just like in Windows Explorer with the choices of thumbnails (you can choose what size of thumbnail - 4 settings), large icons, small icons, list or details. Actually you can customize your viewing many ways. I just found another feature that is sort of fun if you want to make a display for a web page or to show someone what a design will look like, you can have the program make up a BMP picture of your design. This could be quite helpful for those who want to show their designs on different backgrounds (another thing you can set in the program). You can move, copy, cut, paste files all around (not just design files) so it makes it very easy to organize your design files just like you want - including making up new folders to help your with your organization. It even shows other file types like JPG or anything else that might be in a Zip file so you can tell what else is included in anything you download. 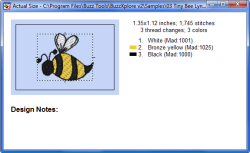 There are many other features that are much like Windows Explorer that I won't get into - I'll let you find them when you get the program :-) Yes, it still does all the wonderful things that Buzz Tools Plus does and so much more. PLUS you also get 3 designs from Murphy's Designs that you can't get any where else :-))) OK, so there are a few more companies too but I am so honored (can you tell?) to be selected to be included in this program. I have Buzz Tools Plus, which I bought locally. My latest purchase was Buzz Explore and I truly love it. It is just what I have been waiting for. I would also like to add that they allow their patrons to download updates to their programs for free. I would not hesitate to recommend them to anyone. Thanks for giving me a chance to share. BuzzXplore is another great product from the Buzz Tools line. I love the 3-D rendering of designs. It is so fast! It is going to be another grand addition to my embroidery software collection. 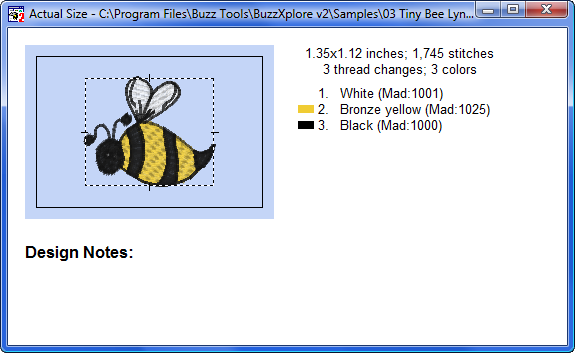 The new BuzzXplore, is a pleasure to use, it makes working with a large number of embroidery files a breeze. Thank You.